Did the 'God Particle' Create Matter? Chapter 1 is the foundational chapter of Genesis, since it summarizes the creation of the earth and everything in it. And Genesis 1:1 is the foundational verse of the foundational chapter, speaking of the primeval creation of the universe itself: “In the beginning God created the heaven and the earth” (Genesis 1:1). It’s been pointed out that if a person really believes this passage, he’ll not find it difficult to believe anything else recorded in the Bible. If God really created all things, then He controls all things and can do all things. Dr. Henry Morris, ICR’s founder, carefully studied this verse and paraphrased it as follows: “The transcendent, omnipotent Godhead called into existence the space-mass-time universe.”2 Another way to say this is: The all-powerful triune God created mass, space, and time out of nothing. God exists separate from His creation. The modern scientific method was developed in the 16th and 17th centuries. Many Christians contributed to the procedures for doing science. The use of careful observation, experimentation, the development of laws, hypotheses, and theory, and the use of mathematics were all important parts of its development. Scientists like Isaac Newton, Francis Bacon, Johann Kepler, Blaise Pascal, and many others who were Christians believed Genesis and honored God in their science.3 Yet as science progressed and more was discovered about how our world functions, many scientists became arrogant and began to reject Him. As the Bible says, “When they knew God, they glorified him not as God, neither were thankful; but became vain in their imaginations, and their foolish heart was darkened” (Romans 1:21). Today many scientists reject Scripture as a legitimate source of truth and attempt to find entirely “natural” explanations for the origin of the universe. They go so far as to say you can’t be a scientist if your explanations of our origins depend upon actions of a supernatural being. Biologists who are under the sway of evolutionary theory and physicists who believe in billions of years since the origin of the universe generally avoid references to a creator. When they or the media mention God, it’s often only as ridicule. For example, the use of the term “God particle” when referring to the search for the Higgs boson in elementary particle physics is a thinly-veiled attempt to mock the belief in a supernatural creator. Interestingly, most scientists dislike the term “God particle” because they don’t want their research tainted by such an association. In the 1960s, British scientist Peter Higgs first proposed the existence of the new physics field, now known as the Higgs field, as an explanation for differences between strong and weak fields in physics. The proposal developed into the idea that in the Higgs field, interaction between the electromagnetic field and the weak field resulted in matter taking on mass. The nickname “God particle” describes the agent that supposedly gave mass to the most basic building block of the universe. According to people who have investigated the subject, the term “God particle” originated with a 1993 book by U.S. Nobel Prize winner Leon Lederman about the history of particle physics, The God Particle: If the Universe Is the Answer, What Is the Question?9 Yet others who recognize how significant the current research on the Higgs boson is continue to use religious themes for it. Lisa Randall, a theoretical particle physicist and cosmologist at Harvard University, recently entitled her latest book Knocking on Heaven’s Door.10 She wasn’t thinking about the God of the Bible, however, but about natural laws that cause particles to be organized and exhibit mass. She believes, for example, that the Higgs field associated with Higgs particles causes space to function like a fluid causing particles which move through it to exhibit mass. And, yet, neither Randall nor any other scientist can explain where such natural laws originated. Her physics is based upon a pantheistic view of the universe, at best. It’s legitimate to try and understand how mass, space, and time originated, but not if the processes we use to explain their origin don’t involve the Creator. 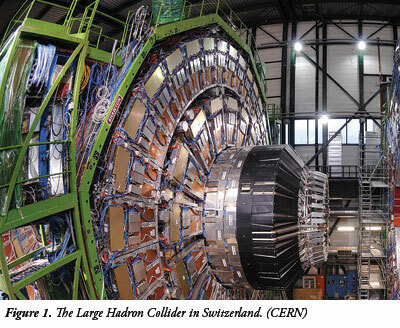 The search for the “God particle” is an attempt to understand the Big Bang theory more fully. The Big Bang says that the universe began as an infinitesimal point and expanded outward, creating space and mass billions of years ago. Although this idea may seem consistent with the description of creation in Genesis 1:1, it is thought to have happened billions of years ago, while the Bible says it happened in one 24-hour day only a few thousand years ago. The theory is also presented as a natural event that didn’t require God’s involvement. Several years ago, Carl Sagan declared to me through correspondence his full confidence in the Big Bang theory and its billions of years, but he admitted to one major problem. He couldn’t understand where the laws of nature came from. He realized that his view of origins depended upon the laws of nature being present first. Yet he had no explanation for their origin because he didn’t believe in God. Scripture provides the reason why he had this problem: “But without faith it is impossible to please him: for he that cometh to God must believe that he is, and that he is a rewarder of them that diligently seek him” (Hebrews 11:6). Sadly, scientists who have the best seat in the house to observe God’s handiwork through a microscope or a telescope often seem to be the first to deny that He is the Creator. Because they deny He is Creator, they fail to grasp the ultimate explanation for the world around us. Scripture says it best: “For the invisible things of him from the creation of the world are clearly seen, being understood by the things that are made, even his eternal power and Godhead; so that they are without excuse” (Romans 1:20). Morris, H. M. 1976. The Genesis Record. Grand Rapids, MI: Baker Book House, 17-36. Morris, H. M. 1982. Men of Science, Men of God. San Diego, CA: Master Books. Griffiths, D. 2008. Introduction to Elementary Particles, 2nd ed. New York: Wiley-VCH. Reich, E. S. Detectors home in on Higgs boson. Nature News. Posted on nature.com December 13, 2011. 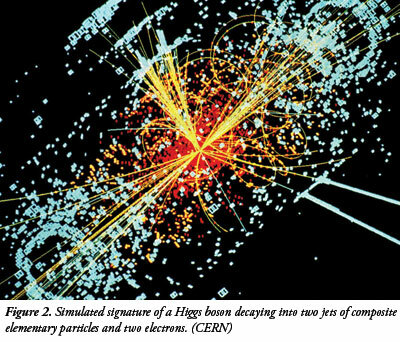 Evans, R. The Higgs boson: Why scientists hate that you call it the ‘God particle.’ Reuters, December 14, 2011. Lederman, L. and D. Teresi. 2006. The God Particle: If the Universe Is the Answer, What Is the Question? New York: Dell Publishing. Randall, L. 2011. Knocking on Heaven’s Door. New York: Harper Collins Publishers. * Dr. Vardiman is Senior Research Scientist, Astro/Geophysics at the Institute for Creation Research. Cite this article: Vardiman, L. 2012. Did the “God Particle” Create Matter? Acts & Facts. 41 (3): 12-14.